A demonstration has been held outside the Ministry of Defence in London in support of a soldier who was arrested for taking part in an anti-war protest. 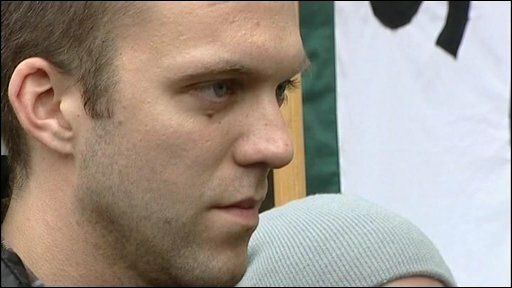 L/Cpl Joe Glenton, 27, has been charged with disobeying a lawful order after joining the march in London last month. The soldier from York has already appeared before a court accused of being absent without leave (Awol) after refusing to return to Afghanistan. Thursday's protest was organised by the Stop the War Coalition. At the march in Trafalgar Square, L/Cpl Glenton addressed more than 5,000 protesters and said the sights he witnessed during his time in Afghanistan forced him to question the morality of his role. He appeared in court in Aldershot, Hampshire, on Tuesday and is being held in custody. The charges carry a sentence of up to 10 years in jail. Having joined the Army in 2004, L/Cpl Glenton, who is based at Abingdon in Oxfordshire, allegedly went Awol in 2007 before handing himself in after two years and six days. He appeared before a court martial in August where his case was adjourned until November.